The meeting rooms are not available on Mondays and Tuesdays. The meeting rooms are accessible via a ramp, electric swing front door and there is an accessible toilet. A portable hearing loop is available. The Board Room can seat up to 12 people. The Meeting Room can seat up to 4 people. 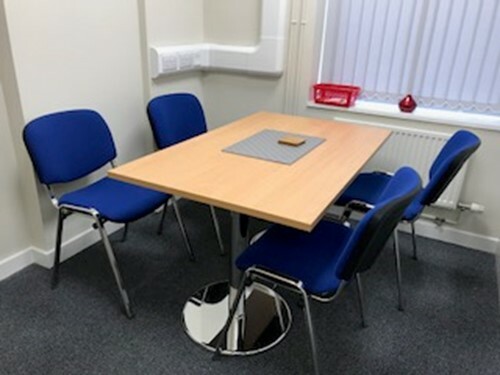 Meeting rooms can be hired separately or maybe combined hire if you require “break out” spaces. 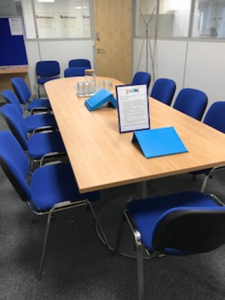 The Council Office reception area can also be used for a break out area if the office is closed to the public at no charge. There is a portable screen and projector and hirers are asked to request this facility in advance of the booking. Free water and hot drink making facilities are also available. Registered charities: Discounted charge rate 20% of hourly rate. The decision regarding the rate to charge the hirer is delegated to the officers of the Council.